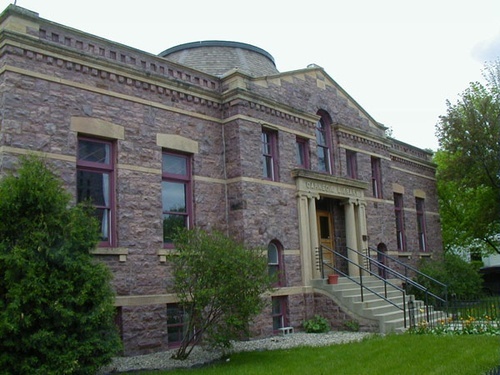 The Carnegie Resource Center is within walking distance of the Corn Palace and an excellent compliment to your Corn Palace tour. The center houses a permanent collection of Corn Palace memorabilia as well as a number of changing exhibits pertaining to Mitchell area history and genealogy. 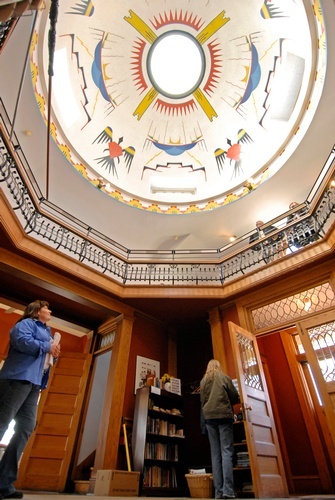 You can view the mural “Sun and Clouds and Rain Over Hills” in the dome of the Carnegie Resource Center painted by the Dakota Yanktonai artist Oscar Howe. Discover the comprehensive collection of Mitchell historical information and Corn Palace memorabila, from the first year it was built, including signed photos by many of the famous performers at the Corn Palace. Enjoy the mural “Sun and Rain Clouds over Hills” by Oscar Howe, a Yanktonai Sioux artist who designed the murals for the Corn Palace from 1948-1971 and also taught school at Dakota Wesleyan University in Mitchell.